STAGE ONE: December 2017, Winterscape. A snowy scene on three windows: birch trees, falling snow and several woodland animals to find among the branches. STAGE TWO: February 2018, First Signs of Spring. With a little help from actual Canadians (Aunt Debbie and Uncle Gerry, visiting from BC), my Mom and three year old niece, we removed the falling snow and most of the snow on the ground. We added touches of spring: new grass popping up, buds on the trees and a few woodland animals waking up from hibernation. Plus a cameo from a local toucan, who added all the warmth we needed! Here the owner wanted several pine trees cut out to put against the windows along with painted trees and stars to complete the seasonal windows. Using colorful embroidery as inspiration, I created simple floral patterning. 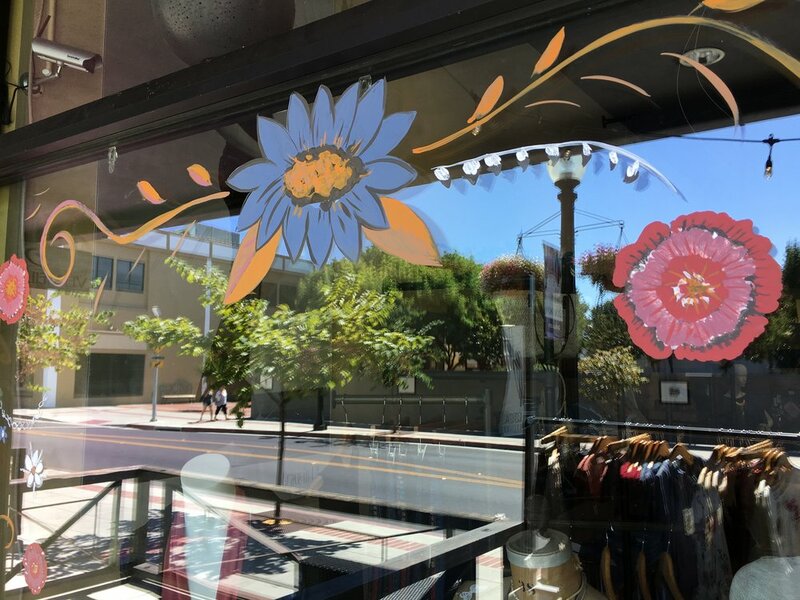 The store owner wanted a tropical flavor on their front windows to welcome summer, so I painted a series of Hawaiian-inspired flowers and leaves.